Red Teams are Obsolete! 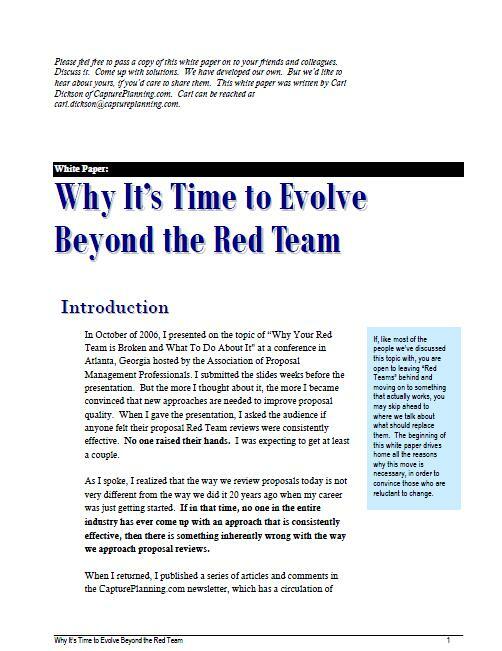 Why, after decades of trying, is no one able to have consistently effective Red Teams? Find out why the color team model is broken and can't be fixed. Our review services will show you the difference between a good proposal and a great proposal. We'll show you how a few simple changes can make a big impact and improve your win rate. We do reviews that are formal, detailed, and criteria based, as well as quick reviews just based on our experience. Either way, we focus on more than just personal opinions. We’ll show you what it means to assess a proposal against what it takes to win, and how to look at things from the customer’s perspective. What you learn from our review of this proposal can benefit all the proposals you produce in the future. It's one of the most cost-effective ways to use our consulting services. Click the Concierge Button to ask us more about it.